Remember the food pyramid? That’s out. The United States Department of Agriculture created a new visualization for the healthiest way to eat. 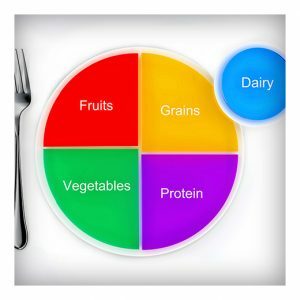 It’s called MyPlate. Many reasons are cited for this change. One is the pyramid itself doesn’t exactly tell you what a typical plate conducive to a healthy lifestyle might look like. That’s really where MyPlate comes from. It shows you healthy portions in relation to a plate: thus the name. Offered, also, are suggestions for a healthier lifestyle. We’ve listed some highlights for you. Your focus, when selecting foods and making dinner, should be to select healthy choices within each food category: fruits, vegetables, grains, protein foods, and dairy. This means, first of all, to include each group in your food choices. Next, it means to be selective about choosing what to get from each group. For instance, whole grain bread is better for you than enriched bread. Most of all, remember what you eat and drink matters, every time you eat and drink. One of the easiest ways to improve your diet is to not fill that table salt shaker. Salt is an essential part of making food: for its taste. But don’t overdo it. Don’t add more than recommended in the recipe and don’t sprinkle salt on that steak right before you eat it. The same is true of sugar. Just leave it in the jar. After you wean yourself off both, your taste buds will adjust. And pretty soon you’ll have an aversion to added salt and sugar. It’ll be worth it in the long run. Setting up big, nearly unreachable goals from the beginning is just setting yourself up to fail. It’s discouraging to not reach a goal. And having a huge goal at the outset may prevent you from eating healthy in the first place. Avoid this by setting small goals: maybe don’t reach for the table salt one day a week, then two, and so on. It’s fun to set goals. And, once it becomes part of your lifestyle, it’s easy to eat well. Share your tips for eating healthy below! The post A Guide to Healthy Eating appeared first on Apartments For Us.